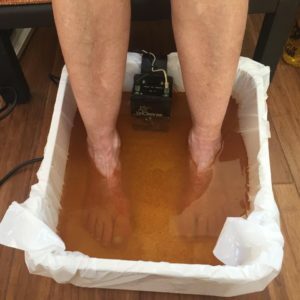 Harmful AC Electricity is converted to low power, safe DC (Direct Current) electricity, which then flows through a patented electrode system that sits in the footbath. The electricity and the metal combine to split the water molecule into H+ and OH-ions. 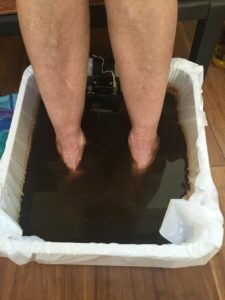 These ions travel through the body, neutralizing oppositely charged particles of toxic substances, and use powerful osmotic pressure to pull those neutralized toxic particles out of the body through whatever skin surface is in contact with the water. As a result of this osmosis, the PH balance is increased significantly. PH balance is a key factor in maintaining good health. It may also be possible to reduce pain and other symptoms caused by long-term toxic, acidic buildup. Most people immediately experience an increased sense of wellbeing and more energy. Children in particular have reported greater mental clarity; young couples planning families should consider foot bath sessions prior to conception; and women seeking to maintain healthy breast tissue throughout their life can also benefit from such whole body purification. We don’t treat symptoms, we help you heal yourself! ©2017 Seeds of Possibilities, Inc. All rights reserved. Notice: The care and maintenance of your body is 100% your responsibility. As a purchaser of any Services, Nutritional supplements and or technologies from Seeds of Possibilities, Inc. (Vieharmony.com) you are accepting 100% responsibility for the effect these products will have upon your health. Any incorrect usage is your sole responsibility. On your journey to wellness some discomforts may occur. These discomforts are categorized for the most part as a healing crisis. You may be tempted to wrongly categorize them as reactions to products. Seek the guidance of a qualified health care professional. By accepting any product or services from Seeds of Possibilities, Inc. (Vieharmony.com) you are accepting the above terms and conditions. These statements have not been evaluated by the Food and Drug Administration (FDA). These products are not intended to diagnose, treat, cure, or prevent any disease.